At least 18 people were injured, some of them critically, after the crash on a level crossing between Millas and Saint-Féliu-d'Amont. The bus had picked up pupils from a nearby secondary school before it was hit by a train travelling at about 80km/h (50mph). 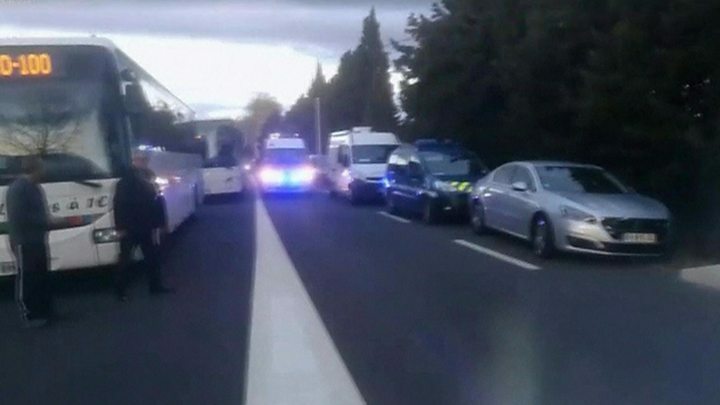 The bus, which had left the Christian Bourquin College in Millas, was on the crossing when it was hit by the train, which was travelling from Perpignan. Visibility was described as good. Four children died at the scene on Thursday. At one point local authorities said two 11-year-old girls had succumbed to their injuries on Friday morning, but later denied this report. A witness who was on the train told local news website l'Indépendant that "it was a very violent crash - it seemed as if the train would derail". Some 30 people were on the regional train at the time. Investigators are waiting to interview the driver of the bus. She was slightly injured in the crash. The train driver also escaped serous injury. Carole Delga, president of the Occitanie regional council, said the level crossing had been upgraded recently and appeared to have been in very good condition. "The level crossing was very visible," she said. SNCF said it had an automatic barrier with standard signals and was not considered particularly dangerous. But the grandmother of an injured 11-year-old girl who had been on the bus told a very different story. The girl said the barrier had not come down but remained raised. "The red lights that normally flash did not come on," she said. "The [bus] driver went through and stopped half way, and that's where the train crashed into it." Rail operator SNCF has modernised level crossings across France in recent years, following numerous accidents, the BBC's Chris Bockman reports from Toulouse. More than 150 emergency workers and four helicopters were deployed as part of the rescue effort. Transport Minister Elisabeth Borne called the crash a "terrible accident" and Education Minister Jean-Michel Blanquer was due to visit a counselling centre set up at the Christian Bourquin College on Friday. A statement from the education minister's office said he would visit "to support students, families, teachers and the entire educational community". In a tweet, French President Emmanuel Macron offered his condolences: "All my thoughts for the victims of this terrible accident involving a school bus, as well as their families. The state is fully mobilised to help them."